Journey back in time to the ancient Roman cities of Pompeii and Herculaneum, buried beneath meters of burning ash during the eruption of Mount Vesuvius in 79A.D. Visit the smouldering crater where the peak of this imposing mountain once loomed over the coastline. Which to Visit: Pompeii or Herculaneum? Many travellers are interested in touring both archaeological sites, preferably in a single day. 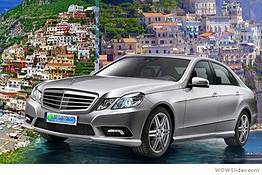 That said, though both are fascinating glimpses into the life of ancient Romans, unles you are an aficionado or especially well-versed in this historic period, you can get a good idea of how a Roman city functioned before the eruption by visiting just one of these two. 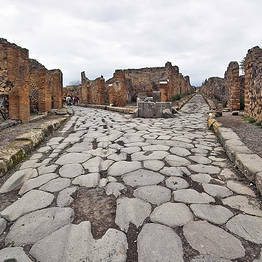 Pompeii is the larger and more famous of the two, and is located closer to the Amalfi Coast. There are more visitors to the site than to Herculaneum, but since the city is so vast, you rarely get the sense of it being over-crowded. During summer and at the weekends you will probably find long queues to enter the site. For this reason we recommend buying in advance online tickets to avoid the line. Herculaneum is the smaller and more dense of the two, and is closer to the city of Naples. Have you got a few hours for visiting the site? Save your time and purchase tickets to Herculaneum in advance to skip the line. 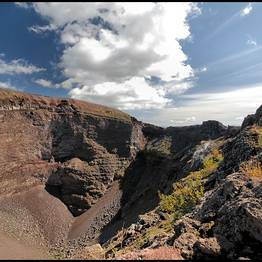 Plan on at least three hours to see the crater on Mount Vesuvius, as it takes about an hour just to walk up from the entrance to the park. Many tours include a 2 hour stop at Pompeii, but to truly visit the site you'll need closer to 3 or 4 hours. Herculaneum can be visited in about two hours. 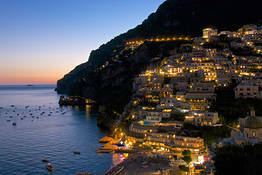 If you are staying in Positano or Amalfi, you'll have to travel first to Sorrento to take public transportation to Pompeii and Herculaneum. The Sita bus from the Amalfi Coast will drop you right in front of the Circumvesuviana train station in Sorrento. Trains depart about every 30 minutes for Naples, with stops along the route at the Pompeii and Herculaneum sites. The entrance to Pompeii is located right across from the Circumvesuviana "Pompei - Villa dei Misteri" station; the entrance to Herculaneum is about a 10 minute walk from the "Ercolano Scavi" station, with clear signs along the route. There are stops for the buses and shuttles up to the top of Mount Vesuvius in front of both the Pompeii and Herculaneum train stations. 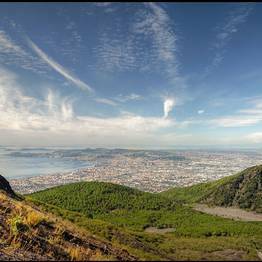 Buses depart hourly and take passengers to the entrance of the Mount Vesuvius National Park. From here, eco-buses transport visitors up the slope of Vesuvius to the trail head for the crater trail. From here, visitors walk up with a park guide. The entire trip takes about 3 hours and and costs around EUR 20/person. Since Greeek and Roman times, locals have been growing grapes on the slopes of Vesuvius to make the unique Lacryma Christi wine. If you are a wine enthusiast, we suggest visiting one of the small wineries along the route between Pompeii and the crater of Vesuvius like Cantina del Vesuvio, which offers guided tours and tastings. Tickets: EUR 15/person, free for children under 18. Free entrance the first Sunday of the month. Here you can purchase tickets to Pompeii in advance and skip the line. Hours: daily from 1 April to 31 October, 9 am to 7:30 pm. Daily from 1 November to 31 March, 9 am to 5 pm. Guided tours: you can request a guided tour from one of the official guides at the entrance to the site. Accessibility: there are routes for visitors with limited mobility beginning in Piazza Anfiteatro and including a section of the site. Facilities: there are restrooms and snack bars. There is also a baggage check at the entrance.